I tweaked this recipe from a recipe I found on All Recipes.com. I couldn't find Spelt bran in the SparkPeople ingredients lists, so I substituted wheat bran in my ingredients list above. I originally used Spelt Bran. 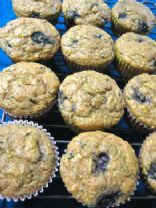 I don't believe that wheat bran would make that much of a difference in the outcome of the muffins.